From the website: Over time, the relationship between humans and nature has become more and more complex. 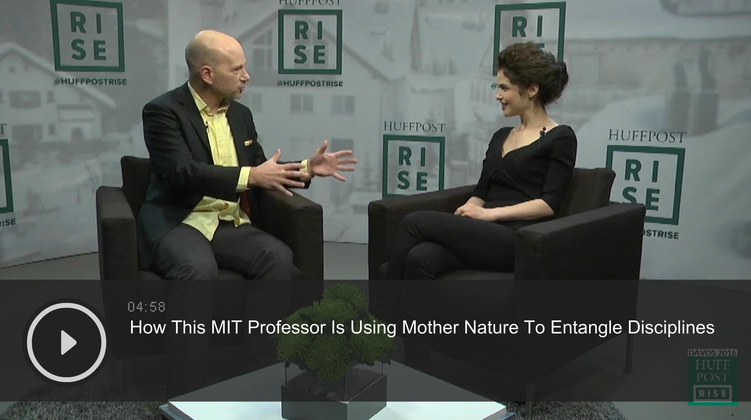 According to Neri Oxman, an Israeli architect, designer and associate professor at the Massachusetts Institute of Technology Media Lab, while humans once relied on Mother Nature, we’re now at a point where we’re co-creating with nature and ourselves “mothering” the natural world. As part of this process, disciplines that used to be separate are now coming together. Oxman herself is leading the charge, with architectural and design works that combine science, art, technology and environmentalism. “We think about new ways of making things... using new technologies that are inspired or informed by nature,” Oxman told Andrew McAfee, co-director of the MIT Initiative on the Digital Economy and co-author of The Second Machine Age, during the World Economic Forum at Davos, Switzerland, earlier this year. What does that mean? The idea is that we’re moving into an “age of entanglement,” where different disciplines are coming together to create solutions to human problems, inspired by what exists in nature. “We can exchange information very, very easily between us,” Oxman said. For instance, using 3D printing, a wearable technology can be customized to the geometry and material composition of your skin. Maybe technology really can live in harmony with nature.